This cake is going down as my new favorite. The wedding, held May 31st at the Marines Memorial in downtown San Francisco, was as coquettish as can be, with inspiration from Marie Antoinette's lavish sytle. In case you were wondering, the cake is iced in pink butteream and the scroll details are hand piped in buttercream and painted in gold. 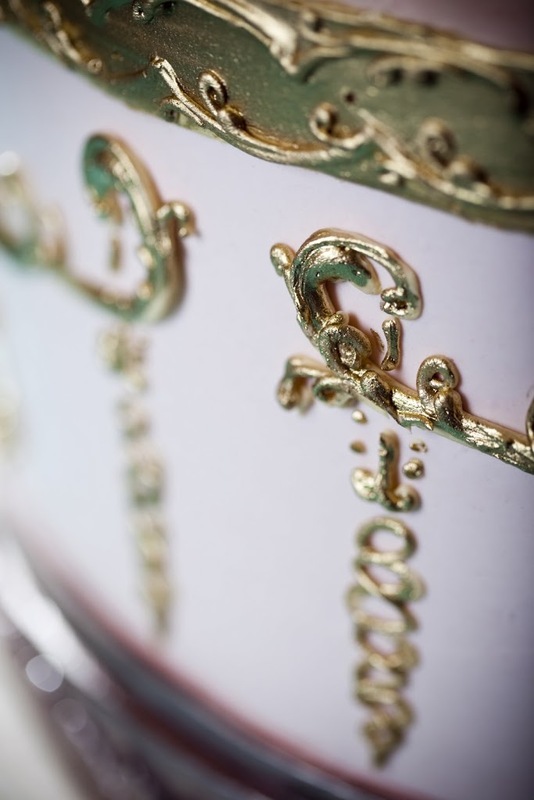 The cameos, bands and bow are made with fondant, painted bronze. The topper was transported all the way from the amazing patisserie, La Duree, in Paris. Here are some shots taken in my studio by my friend, and fantastic wedding photographer, Sabine Scherer. This is the email I recieved a couple days after the wedding. It's a good one, made me feel proud. [I wanted to] let you know that I was absolutely, completely, totally head-over-heels for my cake!!! It was truly stunning, and completely exceeded all my expectations! I literally screamed when I saw it, I was so happy!! All our guests were amazed, and our photographer said that it was the most special and beautiful cake he’d seen in his 16 years of SF weddings. AND it was completely delicious!!!!!! The color was perfect, the shape was perfect, the design, the taste, the gold scrollwork and garlands were completely unbelieveable!